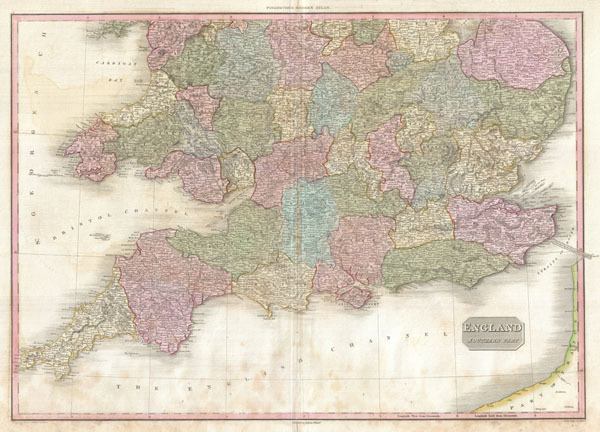 Pinkerton's extraordinary 1818 map of the southern part of England. Covers the southern half of England from Norfolk and Staffordshire in the north to Cornwall in the south. Includes part of France across the English Channel. Covers the entire region in considerable detail with political divisions and color coding at the regional level. Identifies cities, towns, castles, important battle sites, castles, swamps, mountains and river ways. Shows numerous undersea dangers and shoals in the English Channel and around the island. Good condition. Mild damp staining in lower quadrants. Original centerfold. Blank on verso. Rumsey 0732.007. Phillips (Atlases) 724. National Maritime Museum, 409.